Carl Klingberg played six games in Winnipeg this season. Carl Klingberg's first full professional season in North America was one that saw the young, hulking winger make a steady progression into the style of the game splitting time between the AHL and NHL. Klingberg, 21, who played six games for the Jets, when the forward corps was decimated with injury, did not post up any points for the Jets through limited ice time on the fourth line. For the young Swedish forward, perhaps recalling him was more detrimental to his development than helpful, in that, his 37 points in 66 games in St. John's with the Ice Caps saw him in the a top two line role most of the season. The Jets have a diamond in the rough with Klingberg and will need to process his development thoroughly and systematically - that is, not rush him. As with Mark Scheifele, Klingberg finds himself in the group of young Jets players who are seen as the big, up-and-coming stars. Klingberg and Scheifele join players like Paul Postma, Zach Redmond, Jacob Trouba, and Ivan Telegin among a few others as the players the Jets are relying on for their future. With the Jets approach to development being patient and cautious, Klingberg's first season was more of a test to see how he would take to the North American game. However, Klingberg took to it well enough to show he is improving his game and showing his Alex Ovechkinesque personality. 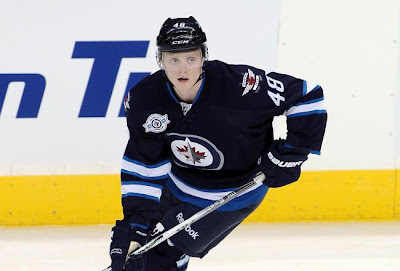 Though he virtually disappeared come playoff time for the Ice Caps (only two points in twelve games), Klingberg's size and raw skill are still being refined and honed in the Jets system. Ranked 24th for the second straight season, Klingberg was seen as an outside chance to make the Jets, but if he has a strong season in the top six or top three in St. John's, his stock and ranking will ultimately rise.